One of the unique aspects of this 9-string extended-range bass is that the body is no larger than a 5-string. The neck width at the body, the string spacing at the bridge, and the pickup length are all about as big as you can go without modifying the body. This was done because the owner wanted a basic 9-string to try out as a kind of prototype, then he would be better able to make design decisions for his next instrument. Heiko says: "The sound is absolutely wonderful! Tight and punchy B and everything is very detailed, clear, and percussive." And it still has the trademark STD sound, with every note having a strong low-mid presence. Click on any of the following images for a high-resolution version. The mouse-over tooltip shows the file size. Overall view of the completed instrument. The upper horn appears to be close to the neck, but it actually curves behind. The 12th-fret marker is the logo of the band. 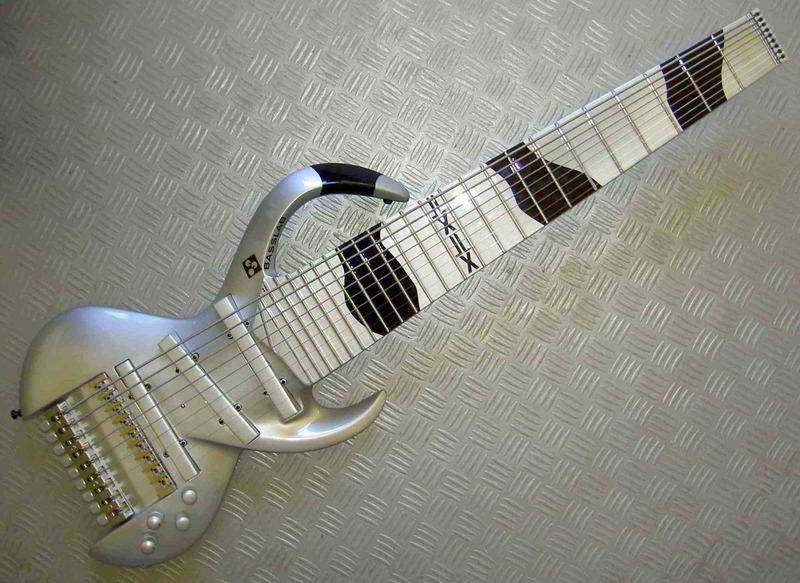 At the left, between the tuners and the bridge, you can see the darker-shaded area of the body where the tuners are secured. This sloped surface has been asymmetrically shaped to provide varying string angles over the bridge. 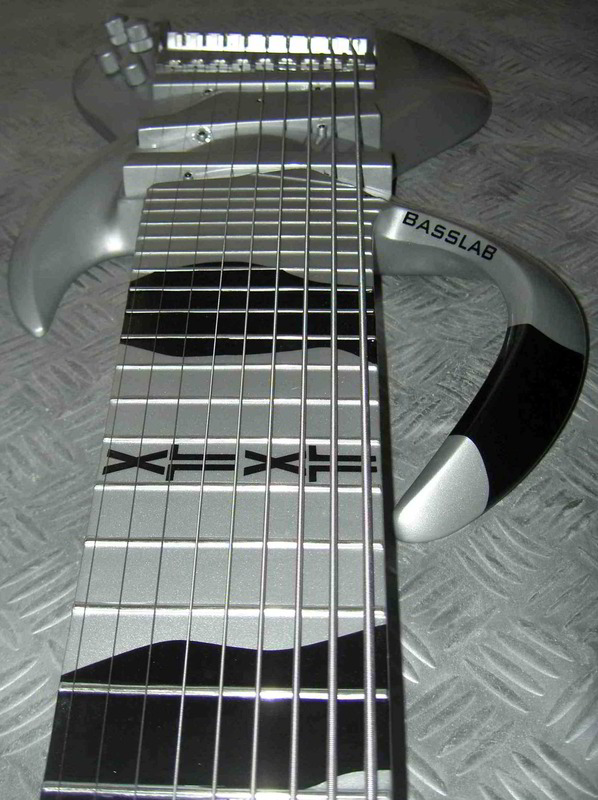 Read more about BassLab's HBAT technology. Another closeup of the body. Compare the three pickups and the way they penetrate the body surface, and you will get some idea of the extreme contouring that is the signature of BassLab instruments. 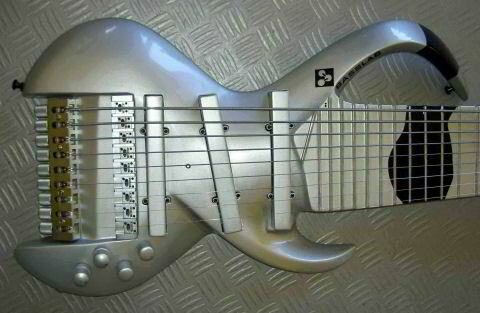 This is not done for looks - it affects the tone. 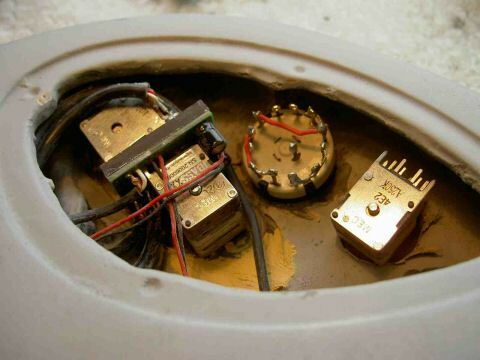 The STD model is essentially an arch-top, and the lower horn sweeps inwards to control and tune the resonance of the top surface. The light-weight bridge sits right on top, while the heavier tuners are out of the way at the edge. Overall view before final hardware installation. The unsanded inside surface of the back of the instrument is visible through the three large pickup openings. BassLab's really are a completely hollow shell! The interior mounting blocks for the pickups have not been installed yet. 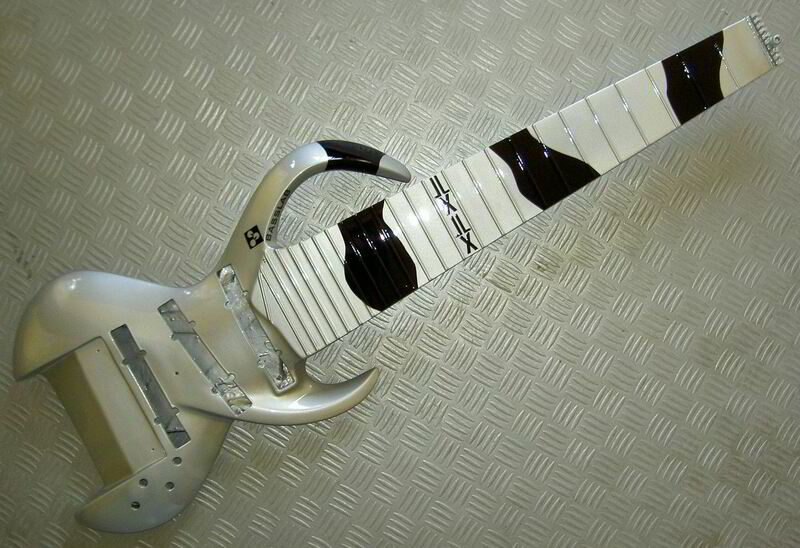 Look closely at the neck, and you'll see that the frets have not been revealed (they're still covered with lacquer). At the nut, a temporary device is installed to provide a handle while painting. On the right are the components for the 9-string bass. At the top, you can see that the head-piece has not yet been shaped to the neck cross-section. 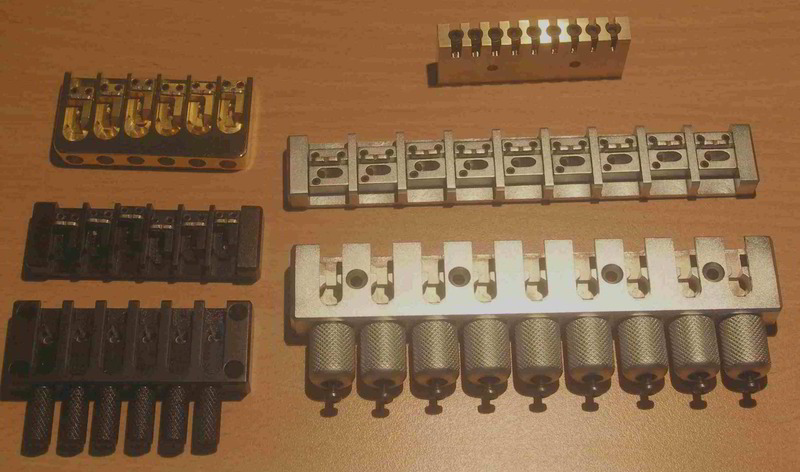 The black items on the left are for a headless guitar, and above them is a standard guitar bridge. Before black paint effects and logo application. 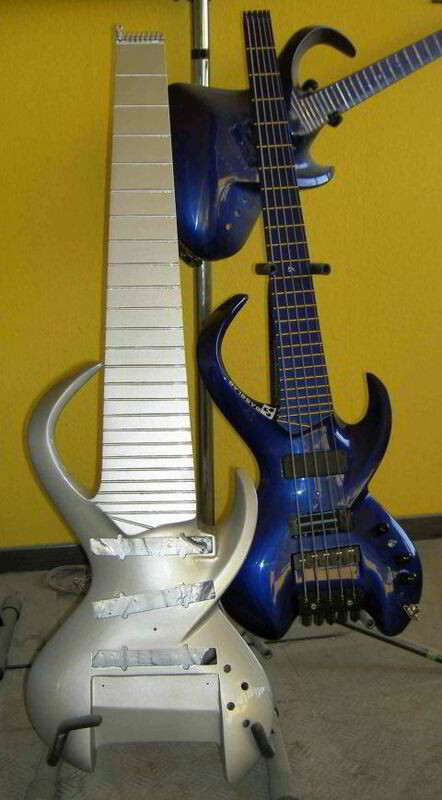 Here the 9-string bass stands in front of a 5-string bass, and you can see that the bodies are the same size. 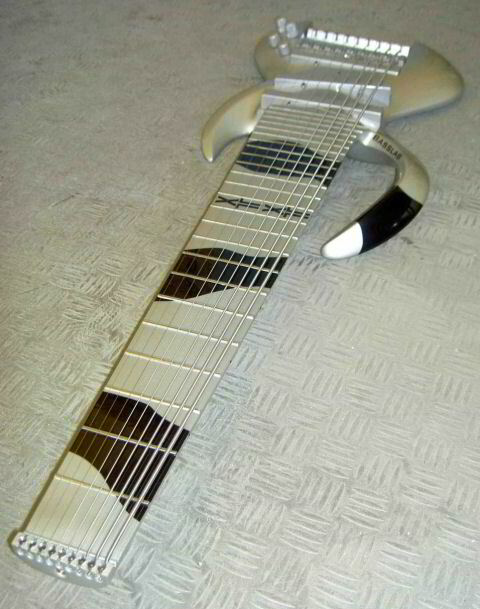 The body of the 9-string was altered in an interesting way to make room for the bridge and tuners. You can see the inside of the body through the pickup holes. In fact, on the right end of the bridge pickup hole, you're looking right through the instrument because the rear electronics cover is off. Before the satin silver color coat. Before applying the final color coat, the instrument is painted with a white ground coat which provides a bonding interface between the composite material and the lacquer. The white coat also provides a good surface for laying out the control positions. 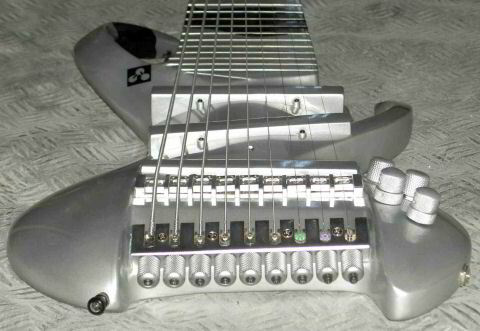 You can see the silver floor of the Lab through the bridge pickup opening. After the ground coat, the control layout and test installation are done. At the left is the BassXX preamp with integrated stacked bass and treble tone controls. Close behind it is the stacked mid control. To the right is the 6-position rotary pickup selector, then the master volume. No special electrical shielding is visible (or required), because the entire body, from tip to tail, is shielded by the BassLab composite material. The edges of the opening show just how thin the composite body shell is. Completed instrument, viewed from the tail. 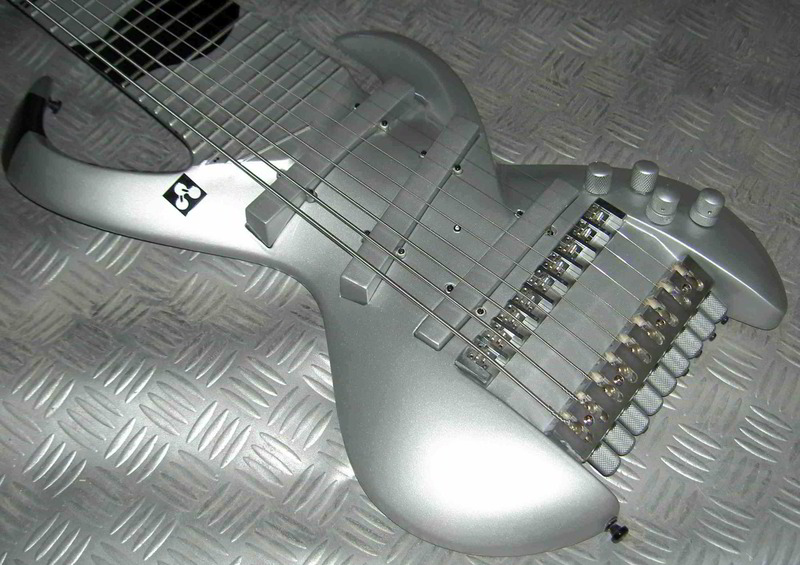 The contouring of the top surface of the body is visible against the pickups. The shaping is all done by hand. You can easily see the stacked control knobs on the right. A temporary set of strings has been installed, since the customer will choose his strings and tuning after he's had the instrument for a while. In the distance, you can see the bridge with the bass side angled lower than the treble side. 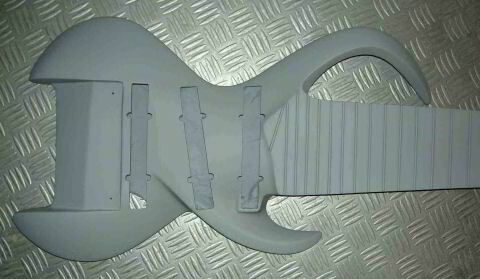 The body contours are again visible against the pickups. Overall view from the head. You can see the truss rod access hole in the headpiece, and also the way the headpiece has been shaped to fit the neck profile. The tip of the upper horn looks white from the camera flash, but this angle shows how much clearance there is between the horn and the neck.